* February 10, 2019 -Henry Decoy Show - Henry Senachwine High School Gymnasium. 8:00 am to 2:00 pm - almost 100 tables filed with displays by carvers and other artisans, and goods for sale. A must-see event for collectors and the general public. CPMA booth at the show. * February 2019 -Bald Eagle Day in Henry - Watch eagles from several areas along the Illinois River. Birds of prey demonstrations, morning & afternoon. * April 26-28 2019 - Midwest Decoy Collectors - Pheasant Run Resort, St. Charles, Illinois - One of the largest shows in North American. 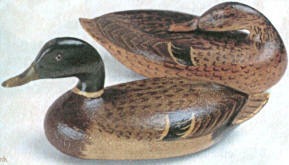 * June 22-June 23, July 19- July21 Decoy carving classes at High School. Two drawings this year: May 26 and Dec 15 at the Museum. Monthly Board meetings are held the second Wednesday of each month at 6:00 pm at the museum May. - Nov and at River Park Center Dec. - April.. The public is welcome to attend these meetings.